NordicTrack skier maintenance kit comes with a bottle of 3inOne oil, a bar of paraffin wax, a piece of emery cloth and a piece of scotchbrite pad. 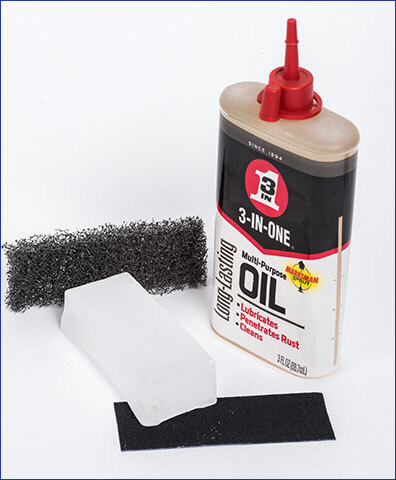 3inOne oil is used to lubricate the endrollers (Idler) wheels. 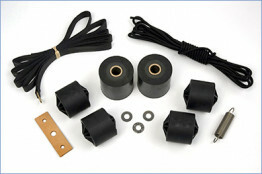 It is also used to lubricate the leather A/E pad and the A/E bearing. When lubricating the endrollers, place a few drops on each side of the endroller, then move the endroller side to side and spin it. Wipe off any oil that may have splashed on the top of the endrollers. You only want to lubricate the axle that goes through the center of the endroller. Never lubricate your NordicTrack driverollers which are the two rollers located in the center of the NordicTrack skier. Paraffin wax is used on the sides of the skis for wood on wood lubrication. If your skis feel like they are sticking, you should coat the ski sides with paraffin wax. If the glide buttons are worn down flush to the sides of the skis, then they should be replaced. 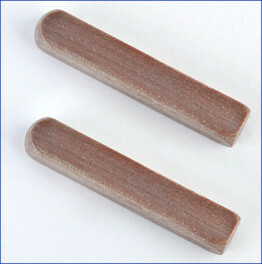 Glide buttons are sold as a set on our site under the wood-style skier section. The emery cloth and Scotchbrite pad are used to clean the flywheel. You will need to remove the dragstrap, then place the emery cloth on the flywheel and at the same time someone should be skiing on the NordicTrack. Follow this process for several minutes until the flywheel is clean. When you are finished, use a paper towel soaked in rubbing alcohol to remove all the black gunk off the flywheel. You can also use the Scotchbrite pad to scuff up the leather A/E pad. You will need to scuff the smooth side of the pad and by doing this, it will allow the 3inOne oil to absorb easier into it. The emery cloth and the Scotchbrite pad are industrial grade to ensure a clean NordicTrack flywheel. 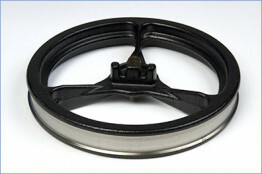 The A/E bearing should be replaced when the arm exerciser drum will unwind itself. 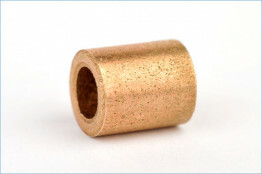 The A/E bearing should be lubricated with 3inOne oil every 3-6 months. The leather A/E pad should be replaced when the pad is extremely shiny or when the holes become elongated and will not sit in position. The leather A/E pad should be lubricated with 3inOne oil every 3-6 months. Free shipping is included with the USA. All international (non US) customers should contact us for a shipping quote PRIOR to placing your order.